The question is always asked: which came first, the chicken or the egg? But for those of us who actually own chickens, we just want our chickens to start laying eggs again this time of year. Chickens typically slow their egg production during winter. Farmers and backyard chicken enthusiasts alike are often dismayed as winter egg production dwindles to near nonexistence. As the days lengthen and spring approaches, egg-laying commences and the delicacy of that orange, pasture-fed yolk tastes better than ever. You may be wondering, why are chickens and eggs so temperamental? In fact, neither is erratic at all; rather, the process is almost as cyclical as clockwork. A hen’s body must rest at some point in the year, and it makes sense that winter is the perfect season to do so; there’s no better time of year to snuggle under a blanket and enjoy a nice long nap. Come springtime, the chickens are well-rested, rejuvenated, and ready to resume laying eggs again. If you’re purchasing eggs from the grocery store, you may think that chickens lay eggs every day. While that may be true of commercial farming, which uses artificial lighting to regulate and bypass chickens’ natural rhythms, that’s rarely the case for the backyard chicken keeper. Chickens lay by daylight. Imagine, if you will, that the sun is their egg-laying charger. If the chickens don’t receive at least 14 hours of sunlight every day, their “egg ticker,” well, stops ticking. There is also the matter of molting—as the days shorten in autumn, chickens shed their feathers. The molting process takes between 2 and 6 months, during which time the chickens are less active as molting depletes their energy resources. While molting, hens will lay eggs sporadically if at all. Keep in mind it takes a full day for an egg to be created. Knowing all this makes you appreciate that breakfast sandwich a little more now, doesn’t it? Of the many wonderful changes that springtime ushers in, my favorite is the changing colors of the eggshells—our very own Easter eggs, painted by nature. If you purchase your eggs from the grocery store, you’re missing out on the naturally colorful eggs laid by breeds such as Easter Eggers, Copper Marans, Ameraucaunas whose eggs range from blue to green to pink. 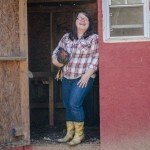 Urban homesteading and raising poultry is more than just a new fad. Owning a backyard flock of chickens is among the simplest of pleasures for my family. We find comfort and pleasure in knowing that our food is fresh and where it came from, as well as watching the changing seasons manifested in the colorful spring eggs. We gladly tolerate the chickens’ winter egg-laying strike in return for the colorful, delicious eggs that next season promises. Spring is an exciting time around the homestead, and so I try to showcase our pasture-fed hens’ eggs in simple and unique recipes. Fry bacon pieces in a large skillet (cast iron preferred) until crispy. Remove from skillet, leaving drippings. Cook onions and garlic in bacon grease until opaque. Add bunches of kale, half at a time as space in skillet allows. Add chicken stock and let simmer until kale is soft; about 5 minutes. 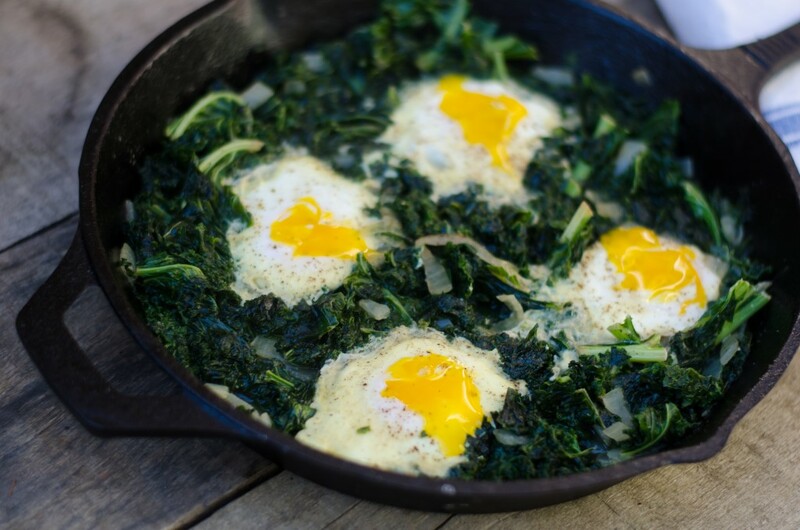 Create four small wells in the kale and crack one egg into each well. Season entire mixture with black pepper, red pepper flakes, and lemon juice. Cover pan and allow eggs to cook until desired doneness. Turn off heat immediately and serve. Place pre-made pie crust in a pie pan, set aside. In a pre-heated skillet, melt butter and add spinach. Season spinach liberally with salt and pepper. Cook until spinach is just wilted. Remove from heat. In a large bowl, whisk together eggs, cream, and cheeses. 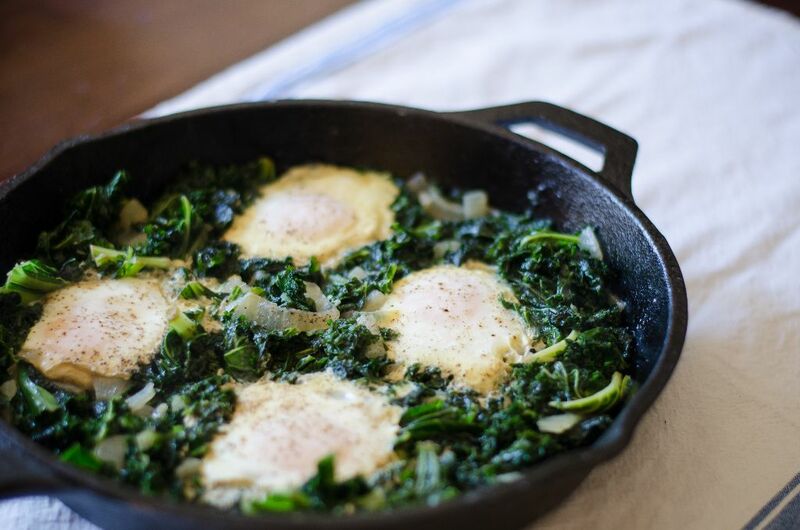 Add cooked spinach to egg mixture. Pour mixture into pie crust. Place several pieces of thinly sliced tomato on top of the quiche. Cook at 375 for 45 to 60 minutes, until top of quiche is golden. Allow quiche to rest for 10 minutes before cutting, as the quiche will slightly deflate.